Andy Hume, for Jewcy, once asked “could David Cameron be the British Obama?” It should go without saying that the answer to that turned out to be no. The success of President Obama in the 2008 elections was to do with many things, but certainly his most amazing feat, which Cameron cannot lay claim to, was appealing to so many disparate voices. Mexicans, despite generally having a very conservative and Catholic-oriented outlook (particularly on abortion issues), voted for Obama in force, while socialists, liberals and other left-wingers saw a hint of revolutionary fervour about him. Additionally, many on the right saw the light in him. Wall Street favoured him, Colin Powell cut ties with his party in support and former neo-con Francis Fukuyama also endorsed him. Obama, on his election trail, was the true unifier. Politics of this kind in the UK today is sadly lost, particularly with Cameron. The Tories tried to play the same game as Blair. Having gone through a line of substandard, right wing leaders, David Cameron stepped in to contain the right of his party and ascend on a programme of compassion and hoodie-hugging. 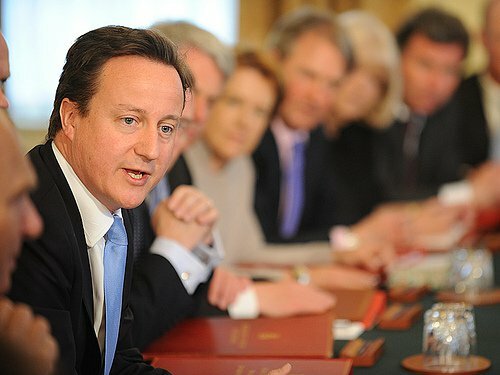 Like Blair with the left, Cameron knew that the right of his party had little in the way of alternatives (the BNP are too “socialist” for the Tory right; UKIP might be an option but are small, largely irrelevant) so he could afford to flirt with the centre-ground, writing pieces for the Guardian and denigrating white collar crime, as part of his struggle to rid the “nasty party” image he disliked so much. In his efforts not to upset anyone Cameron ended up confusing everyone about what his real political outlook was. Does he really aim to emulate Thatcher as a Prime Minister as he said he would back in February of 2009 or does he seek closer allegiance to the type of “communitarianism,” asset based society advocated by Philip Blond? Is Cameron a true blue deep down or is he fighting for one nation? Daily Mail columnist Peter Hitchens, in his book The Cameron Delusion, denigrates Cameron for allowing the Tories to turn their backs on grammar schools and educational selection, as well as buying into the belief that crime can reflect societal injustice and not necessarily a loss of Christian values, wooing the left by waging war on married parents in favour of single mothers, and not speaking out enough for section 28. It is more sensible, today, to say that the fight for societal equality has been won in many places (compassion for the vulnerable, a view of crime that addresses societal factors, tolerance and understanding of homosexuality in school) and this overrides the political will of the right so much so that even the Conservatives cannot win the argument on it in any other way than to embrace it. What Hitchens has identified as measures Tories have taken to appease the far left, are in fact more epochal than they are ideological. But mixing the left/right divide on social issues was supposedly what the Cameron brand was all about. When we accept this we can then understand that inequality, which will continue to rise for as long as the Tories are in government, is largely down to the coalition's economic plans; the regressive rise in VAT and the decision to force single mothers on to job seeker's allowance, which, as Anthony Painter has pointed out, is automatically cut by 10% after a year, and could have detrimental effects for society's most vulnerable in the future. How to settle the deficit is not epochal in the way compassion for the vulnerable is, leaving ample room for the Tories to leave their mark cutting the economy in a way that makes sure not everyone takes a fair hit, and the poor are hit worst of all. Cameron's Tories jeopardised their majority by trying to cover as many political bases as possible, and failing. But their true colours have come to the fore with the budget, and any deception that the Tories are going through an identity crisis should stop there.